The sensor itself sounds like the Fairchild Imaging LTN4625A (with perhaps a little puffery regarding dynamic range). I wonder what the dynamic range in global-shutter mode is. This does look a lot like that Fairchild sensor, but Blackmagic is claiming that they helped develop the sensor, and that it's not a part that is available to anybody else besides Blackmagic. My guess is that they told Fairchild "this is what I want, this is what I don't care about, have this money, give me a sensor". And then maybe they helped with the CFA (they have also said their work developing the sensor produced better colors) and the sensor with Blackmagic-designed (or approved) CFA is what is only available to them. Could it be a sensor from CMOSIS? The CEO of Blackmagic wrote in the NAB email, that "The great news is the millions of dollars we have invested in this new sensor have turned out wonderfully." So they invested in the R&D of the chip it seems. If I was a CEO of a company with millions of bucks ready for investment I'd tell a sensor making company : "Listen, there's this Alexa camera from Arri and here's their chip.. let's copy it and let's create some damn great color science, so it looks like film"
The list of Oscar nominated movies does not lie.. everybody wants an Alexa. It's a shame ARRI is still the only one with a working HDR solution. "Dual-gain architecture" is so simple & perfect it should not be patented. I wish they would report decibels instead of stops. I feel like decibels are more accurate. RED doesn't even lie about decibels. The original BMCC also uses dual gain architecture in it's sensor design. Arri aren't the only ones. What is the working temperature of the sensor with a such cooling machine ??!! Earlier comment is exactly right, it is a CMOSIS customized chip, variation off their 12000 chip. $$M mentioned by the CEO was NRE to CMOSIS. The CMV12000 is 4,096 x 3,072 (not 4,608 x 2,592), measures 22 x 11.88 mm (not 25.34 x 14.25 mm), tops out at 12 bits per pixel (not 16), has a 10-stop range (not 15, except in its phony "HDR" modes), and is global-shutter only (not switchable). So if indeed the new BMD sensor is a custom version of the CMV12000, it's been so heavily modified that it's a totally different sensor and has been designed such that its specs match those of the LTN4625A exactly. Seems highly unlikely. Fairchild did offer its new Maestro MST4625 exclusive to BlackMagic, which is very similar to LTN4625A for machine vision, but I am not sure if it is this one on the flyer. 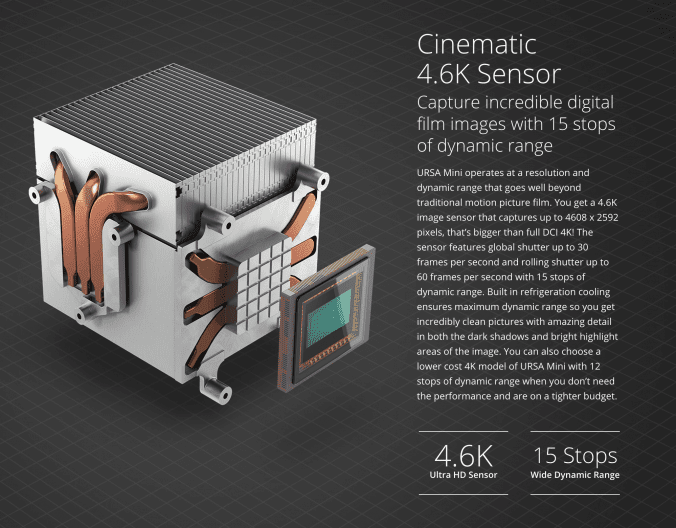 MST4625 should have 240fps in rolling shutter and 14 stops of dynamic range, though I don't know how they do such calculations, it would be interesting to know, how big FW capacity and readnoise really is. Fairchild imho has not produced anything substantial or ground breaking for quite some time, kinda stale over there. What is this groups long term plan?